Anna Akeley, 84, worked in the Physics Department for 29 years teaching survey courses to non-physics majors and receiving College of Science honors for instructor of the year in 1966. 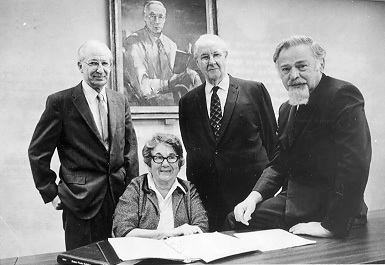 Her late husband, Edward Akeley, was a theoretical physicist at Purdue for over 30 years. Anna retired in 1971, and still resides in West Lafayette. "I was in the right place at the right time," says Anna Akeley, sipping her coffee and looking back on a remarkable life. Seated in her dining room, its walls covered with modern art originals collected from around the world, she spoke with PURDUE PHYSICS about her early life, the circumstances that brought her to Purdue, her years as an instructor, and her recollections of a few of the personalities that colored life in the Department in the '40s, '50s, and '60s. "That was all," she repeats in a marked Viennese accent, "just the right time and place." Indeed, Akeley's memoirs could be a testament to such timeliness. Born in Vienna in 1904 and raised in an upper-middle class family, Anna enjoyed a liberal upbringing at a time when European royalty was waning (she has vivid childhood memories of meeting Kaiser Wilhelm of Germany and Tsar Nicholas of Russia). Anna's parents allowed her to pursue her choice of university study, comparative religion, if she would also agree to study "something with which I could make a living," she says. "I was interested in X-rays, which required the study of physics and math, so I did that instead of going skiing. I don't regret it." Personal circumstances forced Anna to leave school early, and she eventually went to work as an editor for a Jewish publisher in Vienna. When Hitler rose to power, Anna's employer was forced to leave Europe, and Anna was put in charge of liquidating the business under the watchful eyes of the Gestapo. Times were tense, and it was in this atmosphere of suspicion that Anna met her future husband. Edward Akeley was visiting Europe, and at the request of his boss, Purdue Physics Department Head Karl Lark-Horovitz, he had agreed to visit Anna's sister, whom Lark-Horovitz knew. Anna's sister, living in Prague, asked Edward to visit Anna (the Nazis had restricted normal communication channels) in Vienna. but Anna didn't know about this, and Edward failed to explain the situation, assuming Anna knew. "He came to me and introduced himself as Edward Akeley from Lafayette, and I thought, "You are a dirty liar, because Lafayette must be in France, and you have the wrong accent," recalls Anna. Anna thought Edward was a spy, but after her friends in the underground checked him out, she learned that he was a physicist from Lafayette, Indiana, U.S.A. Eventually the misunderstanding was straightened out, and Anna and Edward got to know one another. Edward spent the rest of his trip in Vienna, and vowed to return as soon as possible. One month later, he did, and this time he proposed to Anna. She accepted, but on the condition that she would reimburse him for the money he would loan her after her arrival in America. Anna was unable to get a passport, Edward had to return to America, and Europe was on the precipice of war. But with the help of a network of Quakers using their contacts throughout Europe and the Orient, Anna was able to make a long, arduous, but ultimately safe journey of escape through Russia, Korea, Japan, and across the Pacific, landing in California. Anna finally arrived in Lafayette in 1942, and she and Edward were married. She was now the wife of a physics professor. Anna remembers that graduate students at Purdue in the early '40s had a tough time getting by on average wages of $30 per week. "There was no place for many of these students to stay," she says. "I remember one man stayed in a women's rest room at night for a time, before he was discovered." Scarcely a month after arriving at Purdue, Anna learned she would be teaching physics herself. "I had been introduced to Lark-Horovitz, and he was very kind, calling me Annie and such," she says. "And a short time later, I was told to send my credentials over to him; I learned that I had two weeks to prepare to begin teaching a physics lab for Naval officer students. Imagine! I had never done physics in English, I had had no physics since 1924. Edward said, 'The war is on, you will learn." And so came a crash course in basic physics (in English), given each night by Akeley the Ph.D. to Akeley the instructor-to-be. In two weeks she was ready. "I was terribly excited," she says about her first course. "The induced current experiment was my introduction to the class. And I said, 'Gentlemen, we are going to make an experiment in the seduced current" The students howled. "I was not aware of what I had said." She asked one of the amused students to tell her what was wrong, and the young wag asked if she would like an experimental or a theoretical explanation. It was then that Anna met a future Nobel Prize winner. "Before I responded, I saw a young man looking at me, shaking his head, a very nice man. So I told the other student to sit down, and I made the class work very hard on the experiment." The young man who tried to help Anna save face was Ben Mottelson, 1975 Nobel Laureate. "He knew more in his little finger about physics than I ever knew in my whole life. He never embarrassed me, even though he could have easily. When he got an honorary doctorate from Purdue years later, he came back. When he saw me he said, "Mrs. Akeley, I did it in spite of you!" After that first summer in the basic physics lab, Anna was asked to assist in the physics lab for home economics students, and eventually she was placed in charge of the entire course. "Most of my students took half an hour just to use a slide rule," she remembers. "I asked around if there were any basic high school-type math courses being offered at the University, and I found out there were none. So, I began using the first two or three hours of each semester's course to brush up on trigonometry and geometry, as well as basic math skills. I was the first one to try this at Purdue, as far as I know." Anna taught not just about physics, but also about famous physicists. "I read up on the famous men who were mentioned in the course, and I tried to bring them to life for the students," she says. "How many knew that Isaac Newton thought he was going to be a great religious writer, or that Galileo was threatened with excommunication for his scientific theories? You see, the students began to see these men as real people, not just scientists working and studying day and night." Anna admits that not having a degree in physics had its definite drawbacks. "It was sometimes very tough, because the more I taught, and the more that physics developed, the more I realized how little I knew. Students would ask me about the atomic bomb or the evolution of the universe, and I would have to admit to them, I am not a physicist, I am just a simple physics teacher." The students appreciated their "simple physics teacher," though. In 1966, on a sunny spring afternoon, Anna was lured to a large gathering of University staff and administrators, "me, not dressed up, wondering why I have been asked to sit with all of these important people," she says. She was given a Best Instructor Award, "In Recognition of Outstanding Works Being Done in the Classroom, This Award is Given on the Basis of the Student Body Election to Anna M. Akeley by Purdue Student Government." The award also reflected her popularity as a counselor for women's residence halls and her rapport with her students. "Counseling gave us a chance to just talk, to get to know each other," she remembers. "Not as in the class room. We could discuss politics, religion, what life in Europe was like." In 1969, she also received the Helen B. Schlemen Gold Medal Award for outstanding contributions to women students at Purdue. Anna says that over the years, the biggest change in the Physics Department was its growth, and the effect it had on the atmosphere of closeness. "When I first came to the Department, it was one unit. We all stood together, instructors, researchers, experimentalists, and theorists." Christmas, in particular, brings back memories. "Each year we had a big Christmas party, and everybody came. All of the wives would make food, and we would hold a big party in the largest lecture room. I remember one year, Dr. Karl Meissner, a spectroscopist, played Santa Claus, and as he gave the gifts out to the children, one little boy kept saying, "Santa has an accent, Santa has an accent." With the influx of students, government money, and new research fields, the Department couldn't help but grow larger and more diversified, Anna says, but she still misses those simpler days of Purdue Physics. "We lost that sense of unity." Anna retired in 1971, an occasion she remembers with much sadness. She retired with tenure, the only member of the Physics Department to do so without a physics degree. That may be the biggest honor of them all, to be recognized for her efforts, year in and year out, to make physics a little easier to learn for those who were just passing through. Simple physics from a simple physics teacher. Says Anna, "It was 29 years of sheer delight." "A great man. It was his idea to try to bring refugee scientists from Europe to America, both during the pre- and post-war years. He offered them positions and built his grad school with many of these people. He offered decent salaries, he got theoreticians the books they needed, and he got experimentalists the equipment they needed. "He also put together one of the best physics libraries in the Midwest. Every time there was a change in the Purdue Administration, he insisted that the Physics Library not be in the main library. He also gave the grad students keys to the library so they could go in at any time to study. He was a late night person himself, and he understood that not everybody does their best work during regular hours. "He worked you very hard, but he was fair. He insisted that everybody be at work by eight a.m., Sunday through Friday. He would hold inspection to make sure everybody was at work. He usually held two staff meetings a week. Nobody missed a staff meeting. They weren't very long, and they usually ended with him making a proposal. Saying 'no' to a proposal was very much frowned upon. "He expected his people to put in a lot of time at the Physics Department. In order to enhance their recreation time, he had a piano moved in to the lounge, so people could have music playing when they took a break. "He was very much a gentleman. He held beautiful, lavish dinners at his house; he held string recitals there on Sunday afternoons (he only required staff to work mornings on Sundays). He was just very good at impressing people."